Our guide on starting a bridal shop business covers all the essential information to help you decide if this business is a good match for you. 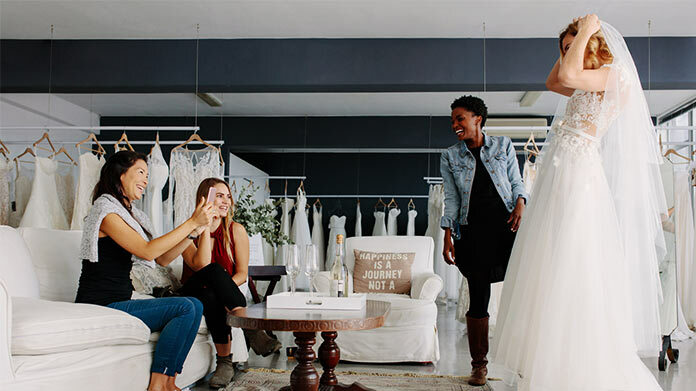 Learn about the day-to-day activities of a bridal shop business owner, the typical target market, growth potential, startup costs, legal considerations, and more! A bridal shop primarily sells dresses and accessories to brides-to-be and members of bridal party (e.g., the maid of honor, the mother of the bride, etc.) They also offer alteration services so everyone can get the perfect fit. Some bridal shops will also sell gowns for formal occasions, such as prom, etc. People who love weddings and fashion will thrive in this business. Weddings are difficult to plan, but they can be extremely rewarding when it all comes together. A bridal shop owner should have an innate sense and passion for highlighting the excitement rather than the stress of weddings. What happens during a typical day at a bridal shop business? A typical day in a bridal shop will likely involve being on the sales floor as much as possible and researching new trends in formal fashion. Owners will also need to allot time for basic administrative duties, marketing, and stocking merchandise. The target market can theoretically be any socioeconomic group, as most brides prefer to wear a special frock for their special occasion. Owners will need to choose who they want to cater to when it comes to offering their fashions. For example, selling mainly to middle-class women, but also keeping an off-the-rack section for those who may be watching their pennies. How does a bridal shop business make money? A bridal shop makes money buying selling wedding gowns, bridesmaid dresses, and other wedding accessories to customers. What is the growth potential for a bridal shop business? Growth potential for brick-and-mortar bridal shops may be stunted by the growth of online sales, but it’s certainly not impossible to achieve lasting success. The abundance of choices on the market today can be not only overwhelming in terms of abundance but also overwhelming in terms of variety, quality, and costs. Those who can hone in on the most in-demand fashions of the day and provide genuine customer service can build up a steady clientele from the very beginning. What are some skills and experiences that will help you build a successful bridal shop business? Owners should ideally have experience in retail before getting started. They should be organized and have a knack for managing people and tricky situations. Those who design their own wedding dresses may find it difficult to transition from selling ad-hoc dresses to having a full-blown store. What are the costs involved in opening a bridal shop business? Owners have to calculate the cost of rent, inventory, staff salaries, marketing, and insurance. Costs can be anywhere from several thousand to $50,000 (or more) in the most competitive neighborhoods. What are the steps to start a bridal shop business? Form a legal entity. Establishing a legal business entity prevents you from being personally liable if your bridal shop business is sued. Open a business bank account. A dedicated checking account for your bridal shop business keeps your finances organized and makes your business appear more professional to your customers. What are some insider tips for jump starting a bridal shop business? There are a variety of ways to achieve success from your bridal shop business. You may have an eye for designers and a knack for customer service. You may be a talented seamstress or designer who creates true masterpieces for their clients. You may even be able to buy a bridal shop and hire a talented right-hand assistant who can put their vision into reality. However you choose to make it happen, you need to understand the people behind the purchase. Special occasions are a beloved way to get a break from day-to-day drudgery. You’re selling not just a pretty gown, but an entire experience. People who do well in this business are not only hard workers willing to take on a variety of roles, but also uniquely talented in their ability to put an overwhelmed bride’s mind at ease. There are also franchise opportunities (e.g., Bride’s Entourage, etc.) for those who aren't quite sure where to begin. Franchising ensures owners start with an established reputation, which can help their store get a leg-up in the very beginning. They'll also have a set business model to follow that has already been proven to be successful with clients. However, even franchise owners need to be willing to think outside the box when it comes to stocking and selling truly unforgettable dresses. Owners may also want to highlight what makes their store unique from online shopping. Despite the surge in popularity, most people still prefer the personal interaction of shopping in a store. Offering people a one-stop shop in their town is a great way to cut through the confusion and frustration of shopping for a special dress online. Not only is it completely impersonal to buy from a faceless buyer on a website, it also takes some of the magic away from the dress. Your promotion techniques will vary greatly depending on your chosen clientele. If you’re selling haute couture for $50,000 or more, you’ll want to network by throwing exclusive parties or similar high-end fashion events. If you’re catering to those who make a more modest income, use internet advertising or television commercials to entice people into your store. Some of the best marketing is having the right staging for your windows. Featuring your best gowns on mannequins is a great way to give potential customers a snapshot of the styles they’ll find inside. The best thing an owner can do is to concentrate on the little things that make a customer’s experience spectacular. A cup of coffee or a glass of champagne can be a great way to set people at ease and show that you're willing to go the extra mile — especially if you're catering to a middle-class crowd. Customers want quality gowns at affordable prices, but they also want to be treated with respect and compassion during a stressful time. Bridal shop owners who choose to do appointment-only consultations don’t necessarily need to build a team right away. However, if you’re planning to run a more traditional store, then it only makes sense to hire people right away. Look for people who have experience in both fashion and customer service. Employees will need to understand the more unique points of the business to succeed. Certain state permits and licenses may be needed to operate a bridal shop business. Learn more about licensing requirements in your state by visiting SBA’s reference to state licenses and permits. A bridal shop business is generally run out of a bridal shop. Businesses operating out of a physical location typically require a Certificate of Occupancy (CO). A CO confirms that all building codes, zoning laws and government regulations have been met. Before leasing, confirm that your landlord has or can obtain a valid CO that is applicable to a bridal shop business. Review all building codes and zoning requirements for your business’ location to ensure your bridal shop business will be in compliance and able to obtain a CO. Brides are usually willing to splurge on a quality dress, even when their wedding budgets aren't exactly infinite. The average cost of a wedding gown is about $1,100, but brides have been known to spend well into five-figures. What are the ongoing expenses for a bridal shop business? Bridal shop owners will need to account for their inventory, rent/mortgage, and insurance costs. They'll also need to take into account the staff salaries as well as ongoing marketing costs and acquisition of new designers. How much profit can a bridal shop business make? Retail markups are substantial in wedding sales. The wholesale cost of a wedding gown is typically double that of the raw cost of materials, and the retail price is typically double that of wholesale costs. So a dress that cost $500 could easily be sold at $1,000 wholesale and $2,000 in a store. From accessories to tailoring to autumn formal dresses, there are plenty of ways to entice a wide range of customers into a store. Bridal shops can also consider adding a ‘trunk party’ element to their business where they take their fashions to the bride's home to show off.